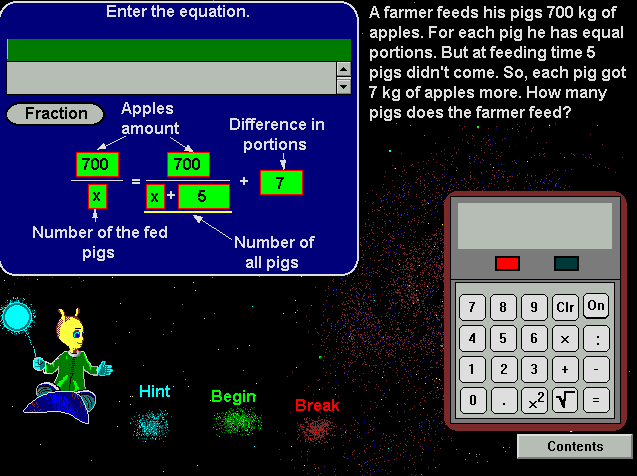 As in all of our programs that deal with equations, Ugo The Alien is your adviser on mathematics. As such it is possible to retrieve the sections on exercises, explanations, mathematical rules, reference, help and settings, and exit the program by means of the "Contents" icon. Quadratics is a very complicated subject. For this reason, it is of particular importance, that it is fully explained. The interactive explanatory section introduces the basics and details the various methods for finding a solution to the pupil, by means of lively dialogue. The exercises consist mostly of animated textual assignments. The pupil must first find the correct equation. If the pupil is still uncertain, he can start with the easy level. This will provide him with a complete equation and commentary. All that he has to do is to solve it. It is explained to him what the relationship is between the various values. On the next level of difficulty, there will only be commentary and an indication of how the equation should look. The difficult level caters to pupils, who progressed to the point where they can compile the equation on their own and solve it. If the pupil cannot succeed, Ugo's hints will be available. The pupil can always choose the variable and solve the equation in as many steps as he likes and by whatever method he prefers. Another part of the exercises consists of assignments, which endow the pupil with knowledge on the basics and background. Another part deals with various levels of difficulty and the techniques, that can be applied for finding solutions. The program aims to acquaint the pupil with quadratics and to expand his mental mathematical ability. The program can therefore be utilized widely. At the lower level, one can exercise quadratic addition, factorization and other methods for finding solutions. The program also offers excellent training for higher levels. Attractively presented exercises and well-designed, contemporary graphs conclude the positive aspects of this training program.